After NCSU in Raleigh (which by-the-way I should say it felt strange to be back in the east coast in March with near freezing temperatures, etc.) I was off on an overnight flight to London Heathrow then to Stockholm to a conservation genomics workshop (link) organized by Aaron Shafer and Jochen Wolf of Uppsala University. A man was waiting for me at the airport with my name on a card as soon as I walked out. He drove me out into the country to the place the workshop would be held for the next few days. The location was amazing and the most surreal aspect for me in the rapid transition from Hawai'i. It was a medieval mansion/castle (Wiks slott) in a rural Scandinavian farm and forest landscape. After arriving it started snowing and several inches accumulated. We all stayed on site so there was no travel back and forth to the nearest town. We ate meals in a lower floor with long tables, small barred windows set deep into thick walls, and arched walls and ceilings. I soon discovered the castle had hidden passage ways, suits of armor, etc! I also had jet lag so in the middle of the night I couldn't sleep so I went for a walk, and to top it off there was a full moon hanging over the castle! The point of the workshop was to discuss if there was a general reason to include new genome level technologies (versus classical molecular genetics of a few loci) in species conservation genetic applications. The discussions and presentations were a lot of fun and I'm hopeful some impact will come of it. It was also nice to be back in Europe after being away for 2 1/2 years. There are lots of things I like about Europe and I was a bit homesick. It was also fun to listen to and read Swedish and to try to decipher the meanings. I was surprised that I could recognize some words based on their similarity to German and/or English. Finally a small world note. I already knew Jochen Wolf, one of the organizers, because we worked at the same institute in Germany before he moved to Sweden and I moved to Hawai'i. Also, the other organizer Aaron Shafer was at the same institute in Canada with Jolene Sutton who is working here on the mosquito/avian malaria project. This entry was posted in Uncategorized on March 30, 2014 by Floyd A. Reed. ...and I'm back. First a note about NCSU. That was a whirlwind trip. 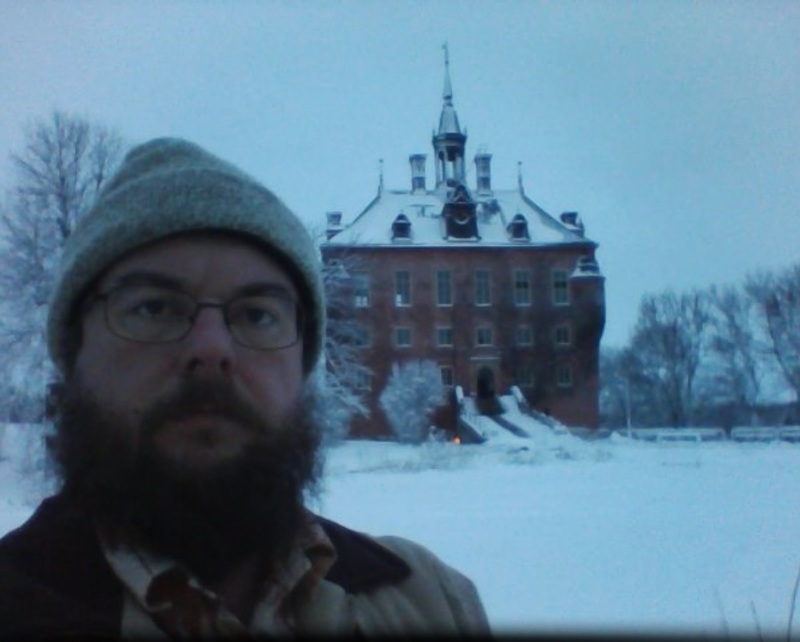 It was very surreal to be on a tropical island one day and in a castle in Sweden set in a snowy landscape on another day. First of all I want to post the slides for my presentation at NCSU in Raleigh, my first stop. Here is a link to my presentations page. At NCSU I was asked to include some background on the social landscape here in Hawai'i as it pertains to genetic pest management. This is something I am trying to get my head around so I presented my understanding at this point---how GMO crops and classical biocontrol (which genetic pest management tends to be initially compared to) are connected to issues of sovereignty and self determination in Hawai'i. I also wanted to make the point---and was able to discuss this point to a great extent---that we tend to only think of regulatory and research funding agencies and labs doing research as the major players and tend to forget about the public until a technology is ready for deployment (then it is too late to make major changes and we tend to try to convince the public to accept what we have already decided). I met with a lot of people and got a lot of good feedback, from techniques to raise and work with Culex mosquitoes in the lab to embedding non-biologists in the group for feedback on social issues to shape the ongoing research program. NCSU has an NSF IGERT program to focus on cross disciplinary genetic pest management (link). I was able to meet with a lot of people in this program during the visit. At the moment the current cohort of students is focused on invasive mice on islands and ways to suppress the population. They are doing some pretty exciting stuff. This entry was posted in Uncategorized on March 24, 2014 by Floyd A. Reed. Sorry, I've been really bad about making posts over the last few months. Mostly this is because I am teaching two new classes this semester and it has taken a lot of my time. However, this week I am traveling! First to visit NCSCU and then to a Conservation Genomics workshop in Uppsala. I will post updates about each in the next few days. This entry was posted in Uncategorized on March 17, 2014 by Floyd A. Reed.